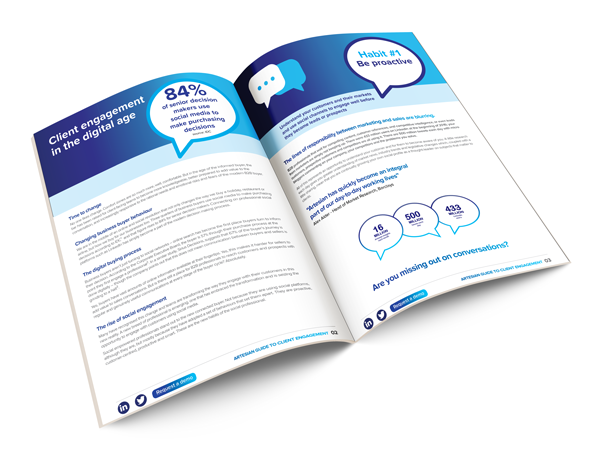 Download 'Artesian's Guide to Client Engagement'. The way your customers are engaging has changed dramatically. According to a recent study, buyers are now 57% through their purchase process before they engage an insurance professional. How are you responding to their evolving needs? Smart insurance professionals know that their personal success is an outcome of being focused on their customer and their needs. In our latest guide, we enable you to engage your clients successfully by developing seven positive habits. Or find out more about how enterprises using Artesian have transformed their client engagement. Immy Tugcu is VP, Services at Artesian Solutions. She is responsible for the Support, Taxonomy and Training teams, taking the customer through implementation, enablement and training to an ongoing managed service. She is passionate about delivering exceptional service for customers and about providing leadership to her teams in a way that inspires them to deliver and progress. Before Artesian, Immy worked with some of the UK’s largest businesses, providing project and content management within the publishing, security and engineering industries.